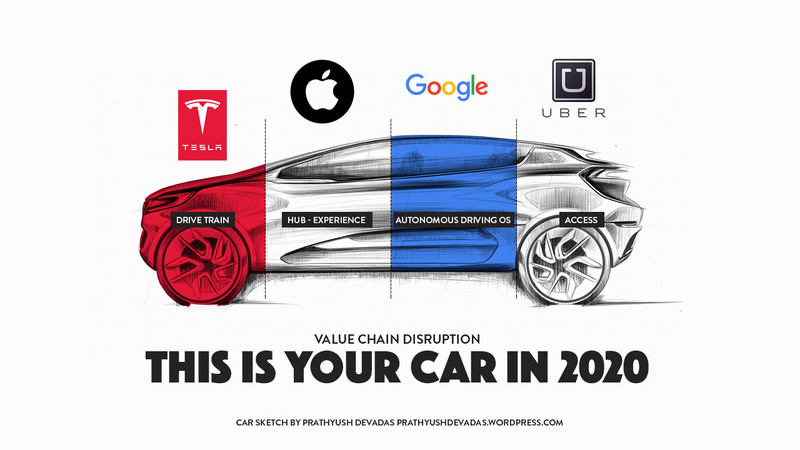 As an example of value chain disruption; what might your car look like in 2020? Autonomous cars are going to need software to analyse real-time driving data, identify situations and give instructions to the vehicle. Google is building this. They are most likely not building their own car, but offering any company who wants to be a car company access to this software. They are making the Android OS for autonomous cars. Tesla has built a massively impressive electric drive train. Hooking it up to charging stations running exclusively on their renewable energy takes transportion close to zero marginal cost (which would completely revolutionize the efficiency of transportation and the cost to our world). Tesla has already open-sourced some of its patents. Any company who wants to be a car company could probably license a Tesla drive train in the future. Apple is in the business of making hubs. Offering software with customer friendly business models in order to continue retailing their hardware at an enormous pace. They designed iPay, Health Kit, Home Kit, Apple TV and iTunes. All of them are global ecosystems, not products or services. They connect us to everything we need in a given experience – and they reimagine this experience for us. And Apple is now most likely building an ecosystem/hub for cars. People are going to spend an enormous amount of time being transported around, but when there is no driver of the car the whole experience changes – to what? Car incumbents seem to have a hard time divorcing their designs from a time when cars had an alpha male and a steering wheel. It might just be that the future experience of transportation is something any company who wants to be a car company can buy from Apple. Lastly; people don’t want to own their own cars, they want access to a range of cars tailored to fit different purposes (today’s cars are often all-purpose as they have to fit any activity the owners might need. If you are leasing access to a car, it would be best if the vehicle was purposefully designed specifically for the job you are hiring it for). Who is going to provide the mega-system connecting all possible cars in any given location, giving people instant and frictionless access to vehicles? Uber is surely lining up to design and provide this service, working hard to solve the last mile challenge – how the car can drive itself to you. Any company who wants to be a car company suddenly is freed from the limitation of having to partner with dealerships around the world. All they have to do is put the cars on the road and connect them to Uber. Of course , all of this might be wrong. But, my point is rather to stress the fact that an industry is not going to be challenged by someone copying the entire value chain. Disruptors are going to go after one piece of the puzzle, and work hard to completely rethink it.